FILE - A girl waits to receive food provided by the United Nations' World Food Programme at a camp for internally displaced persons in Azaza, east of Ad Damazin, capital of Blue Nile state in Sudan, Oct. 21, 2015. Foreign policy almost always takes a back seat to domestic concerns during the U.S. presidential campaign season. Candidates rarely win over any voters in diners in New Hampshire or town hall events in Iowa touting their plans for economic investment and security frameworks in Africa. In 1999, then-candidate George W. Bush went so far as to declare Africa “irrelevant” to U.S. foreign policy during his first presidential run. But even if a voter never changed a ballot based on U.S. policy in Africa, surrogates from all five presidential campaigns gathered Thursday to discuss those issues on Capitol Hill, providing an unusual glimpse into the thinking behind the future leader of the United States. The gathering organized by the Africa-America Institute also brought together former assistant secretaries of state for African affairs with other speakers who had varied credentials qualifying them to speak about the continent. 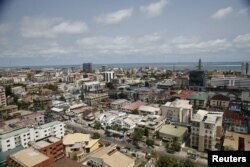 A view of the Victoria Island district in Nigeria's commercial capital, Lagos, April 19, 2016. “I can be very fast about Senator [Ted] Cruz’s Africa policy, because he doesn’t have one. He’s been busy with other things. Texas takes a lot of time all by itself,” said Michael Ledeen, a Foundation for Defense of Democracies scholar described as an adviser to the Ted Cruz presidential campaign. While Africa has taken on a position of greater importance in U.S. policy during the Obama and George W. Bush administrations, the reality is that the continent has rarely been a source of disagreement between Democrats and Republicans. J. Peter Pham, director of the Africa Center at the Atlantic Council, who served as an Africa policy adviser on the presidential campaigns of John McCain in 2008 and Mitt Romney in 2012, said any administration would have to confront the demographics of change in Africa. By 2050, 1 in 4 workers around the world will be African and they will more than likely be working in some of the fastest-growing economies worldwide. To many of the campaign surrogates, Africa appeared to be a proxy for the candidates’ own views on economic issues. 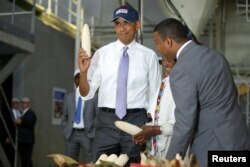 FILE - U.S. President Barack Obama shows off a ear of corn grown by a farmer, second right, participating in the Feed the Future program as he tours the Faffa Food factory in Addis Ababa, Ethiopia, July 28, 2015. “Economic development and strong business ties would be something to look for in a Trump White House,” said J.D. Gordon, a former Department of Defense spokesman who described himself as a foreign policy adviser with the Donald Trump campaign. Gordon said he did not speak directly for Trump but could share some of his worldviews and how Trump’s familiarity with deal-making could apply to Africa. Two former assistant secretaries of state for African affairs representing the John Kasich and Hillary Clinton campaigns found areas for bipartisan agreement. Ambassador Herman Jay Cohen, who described himself as representing the views of Republican Kasich, praised President Barack Obama’s Feed the Future, a program that boosts African agricultural development. “Africa cannot only feed itself. It can feed others,” Cohen said. Michelle Gavin, an adviser to the Clinton campaign, agreed, while calling for a deepening regionalization that would increase inter-African trade. Kenya's National Counter Terrorism Center Director Martin Kimani, center, is assisted in lighting a candle during prayers to commemorate the first anniversary of the terrorist attack at the Garissa University College, in Kenya's capital, Nairobi, April 2, 2016. The bipartisan spirit over economic development in Africa did not extend to the discussion of how to deal with terrorism on the continent. Speaking for Kasich, Cohen called African Muslims “tolerant” and said the problem of Islamic terrorism on the continent was related to "Arabic-speaking peoples.” Cohen blamed Wahhabi influence from Saudi Arabia. The assertion appeared to surprise many of the observers in the room, and it’s one Pham said could occur when Africa is perceived as a single entity rather than a complex gathering of countries and cultures. That perspective may increasingly come to guide U.S. policy in Africa during the next administration.